UPDATED: Fri., March 22, 2019, 10:07 p.m. 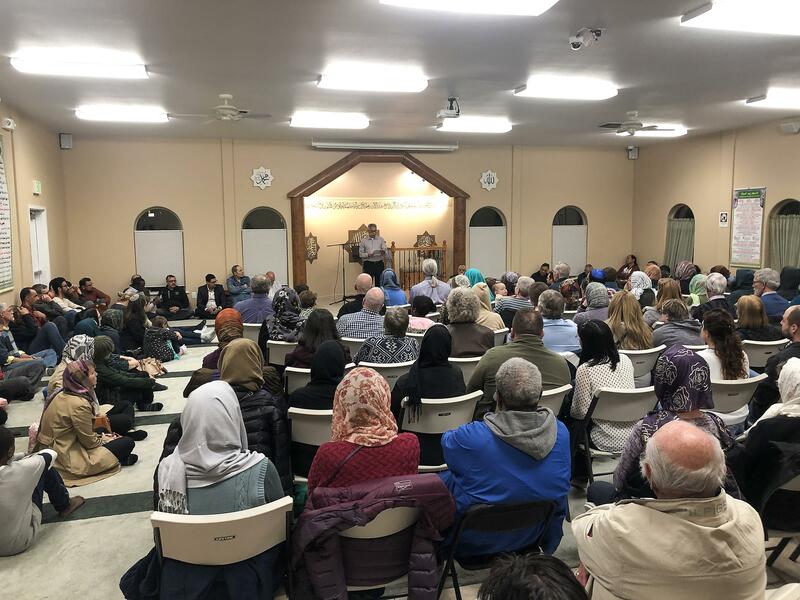 It wasn’t just members of the Islamic religion who listened to prayer and a memorial service Friday night in Spokane, as individuals from a range of backgrounds gathered to honor the 50 victims of a shooting at multiple New Zealand mosques last week. Members of Christian, Jewish and Hindu faiths and law enforcement gathered Friday at the Islamic Center of Spokane, 6411 E. 2nd Ave., in Spokane Valley. In a joint letter drafted by some of the members of different faiths, they condemned the terrorist attacks and wrote they are in mourning over the loss of the Muslim victims. Neal Buckaloo, a retired Lutheran pastor, was one of the hundreds of supporters who came to the Islamic Center. He said the memorial provided an opportunity for many faiths and beliefs to make a statement and also a connection with the Muslim community. “It’s unfortunate it took something like that tragedy to generate this,” Buckaloo said. Mamdouh El-Aarag, a board member of the Spokane Islamic Center, said the turnout Friday was amazing and beyond his imagination. The hundreds of people in attendance occupied all of the seating in the Islamic Center, and many were left to stand against walls or sit on the floor. El-Aarag said there are usually 20 people at a Friday night event. Last week’s shooting took place in Christchurch, New Zealand, where the shooter opened fire in a mosque, drove to another and open fired again, killing 50 people and injuring another 50 in total. He streamed the first 17 minutes on Facebook Live and authorities later found an anti-Muslim manifesto that he had written. An armed sheriff’s deputy stood guard at the entrance of the Islamic Center on Friday night, something that isn’t common, but was also done the day of the New Zealand shooting. Spokane County Sheriff Ozzie Knezovich spoke at the memorial and said he has stepped into a house of prayer too many times after a tragedy. He said radicalized hate is one of the biggest threats to humanity. “When are we going to stop this?” he said. Abdallah Almanasrah, a student at Spokane Falls Community College, said gatherings like the one at the Islamic Center in Spokane Valley can help prevent similar incidents. Almanasrah said after hearing about the shooting last week, he feared attending the Islamic Center. Published: March 22, 2019, 9:52 p.m. Updated: March 22, 2019, 10:07 p.m.